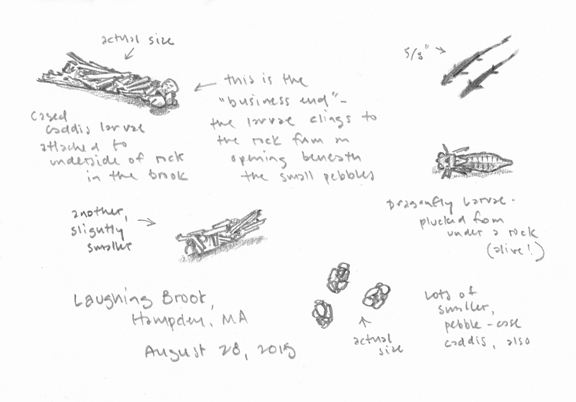 Posted on October 8, 2015 by Barry V.
Thirty years ago, I had my first solo show of nature art at a wildlife sanctuary near Springfield, Massachusetts called Laughing Brook. Back then, Laughing Brook was a fully staffed sanctuary, with a large visitor center and a “zoo” of native animals. So, it’s understandable that when I pulled into the parking lot this morning, a flood of memories accompanied me, although very little was as I remembered it. The visitor center was gone; as were the animal enclosures, and even the trails and parking area seemed strangely out of place. Laughing Brook’s history is one of floods and fires that I don’t need to recount here, but in short, the “zoo” was closed down in the 1990s and the visitor center demolished after a fire in 2004, converting the location to an unstaffed property. As recently as 2005, another major flood washed away trails and much of the parking lot. No wonder I didn’t recognize the place! But as much as things have changed, some things remain the same. East Brook, that so inspired the writings of Thornton Burgess, still tumbles clear over golden gravel bars and threads in and out of mysterious tangled roots along the banks. Kingfishers still flash along the stream corridor and dragonflies still dance in the shafts of light sifting down through the forest canopy. It’s a reminder that buildings, trails, parking lots, meadows and ponds may come and go, but rivers are as old as the mountains. At the pond off the Mort and Helen Bates Trail, I tried to approach some blooming arrowhead along the shore. 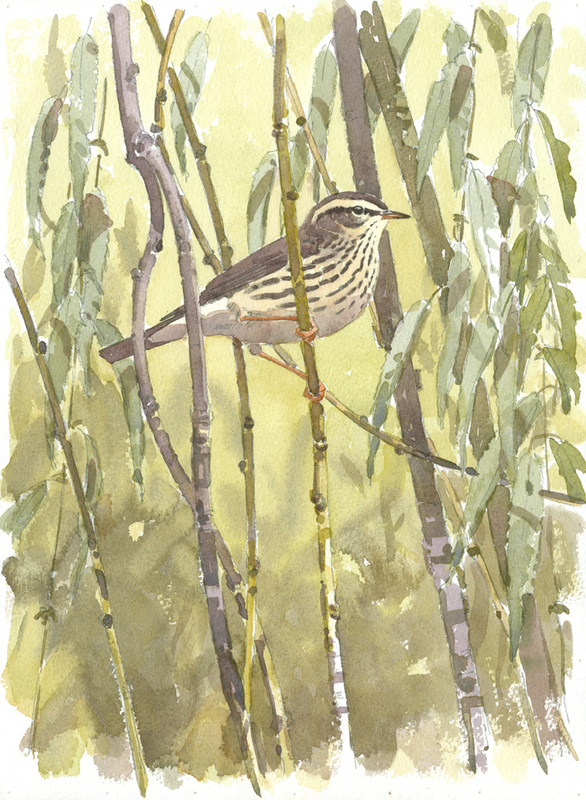 Most of the arrowhead plants were past blooming, and I never did find a blossoming specimen close enough to paint, but in the process I flushed a bird from the undergrowth that flew up into the lower branches of a weeping willow. 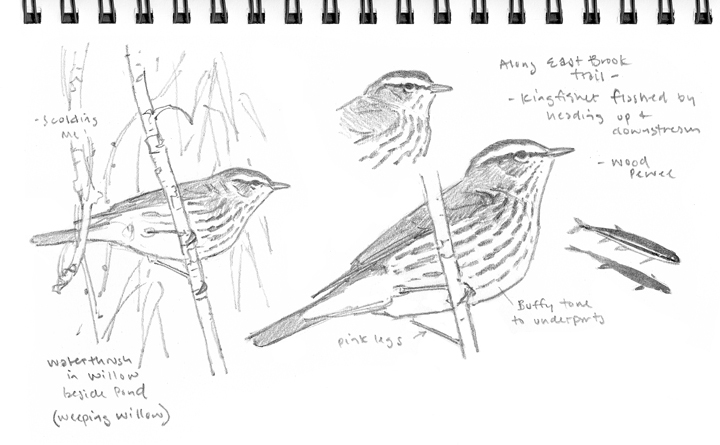 It was a handsome northern waterthrush, and with my binoculars I got good enough looks to make some quick sketches in my sketchbook. Later in my studio, I used these sketches to develop this watercolor. There are many spots along the East Brook Trail where one can take little spur paths down to the edge of the brook, and in these low-water conditions, it was even possible to walk right into the streambed (and still keep your feet dry) by picking along the gravel bars or hopping from rock to rock. 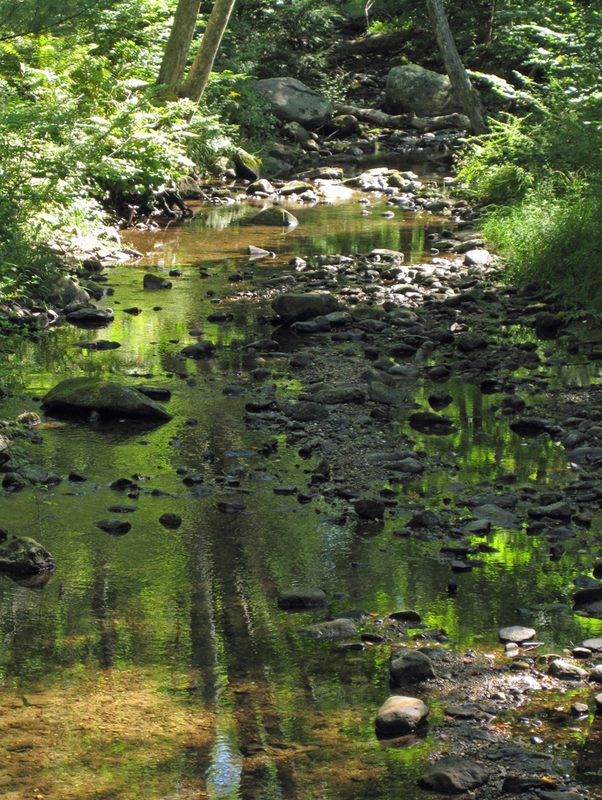 I settled down in one such location and made an exploration of the gentle pools and riffles. 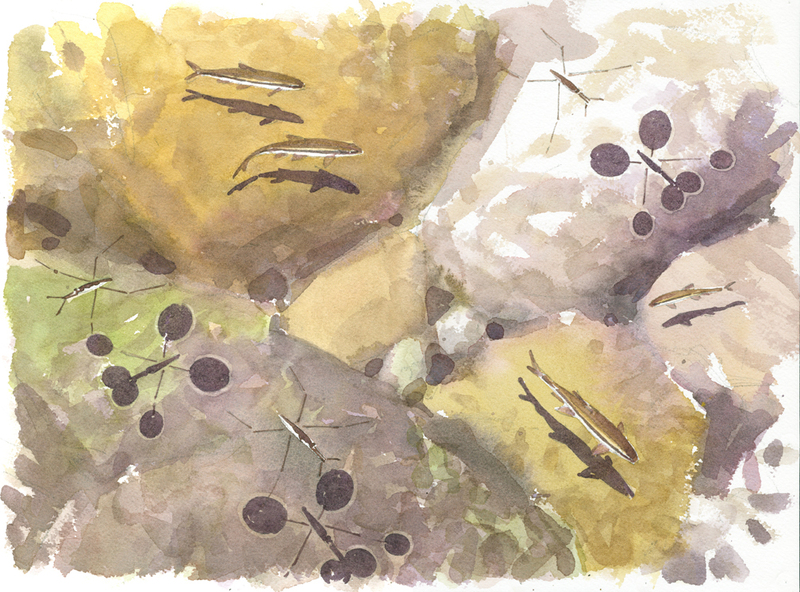 Blacknose dace are abundant in the stream, ranging in size from 5/8” to 2” long, and water striders patrol the water’s surface, casting those strange geometric shadows on the streambed. 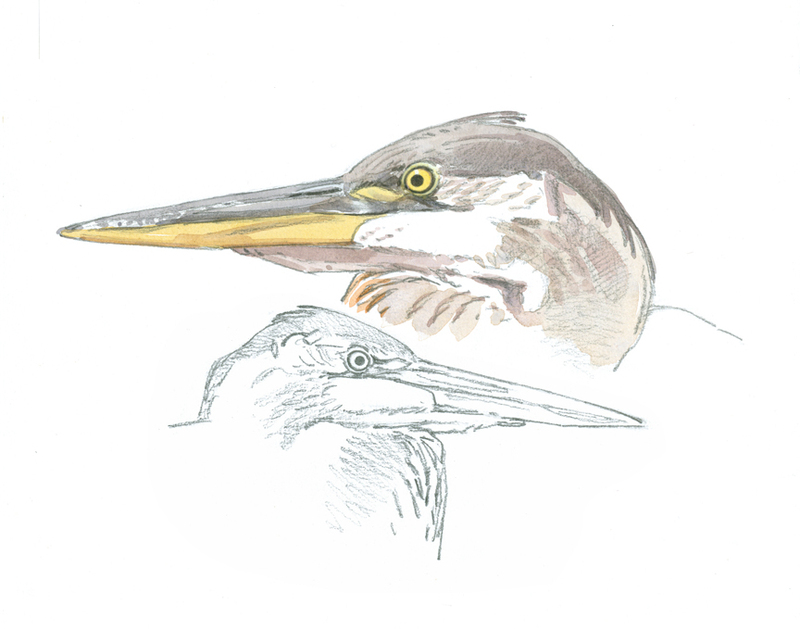 I make studies of both in my sketchbooks, and combined the two species later in this studio watercolor. Caddisflies of various species are also in abundance. The soft-bodied larvae of caddisflies construct little shelters or “cases” that they live in, and each species makes a distinctive type of case using sand, pebbles or twigs. Some of the smaller species build cases that look like little clusters of pebbles attached to the underwater rocks – and these could be easily overlooked. Other species build elaborate twigs cases up to 2 inches long that are easy to spot in the stream bed. Held in the hand, the larvae will sometimes emerge from one end and wave their legs around. 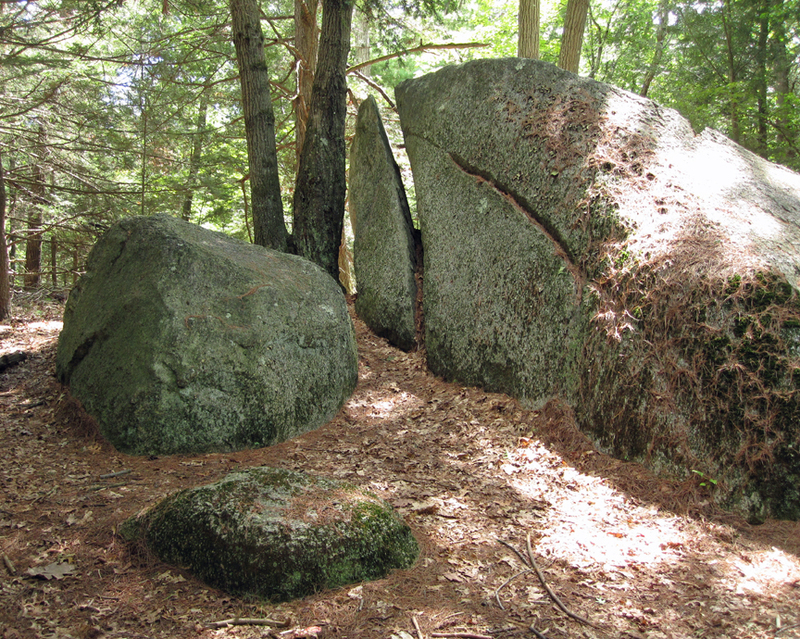 A big glacial erratic called “Split Rock” is worth a quick detour off the upper stretches of the East Brook Trail. From one angle the boulder looks just like a sperm whale, with open mouth, rising up out of the deep! Heading back to the car, I stop once more at the pond and notice a young heron perched in the big dead tree on the far shore. With a scope, it’s an excellent view of the bird, and I can’t help but try making some studies. It looks like the bird will stay put for a while, and indeed it does – giving me time to make some detailed studies of the birds expressive face and head. This entry was posted in Artists, Barry Van Dusen Residency, Natural History, News and tagged Barry Van Dusen, Birds, Blacknose dace, caddisflies, Great Blue Heron, Heron, Laughing Brook, Laughing Brook Wildlife Sanctuary, Museum of American Bird Art, Northern Waterthrush, Sketching, sperm whale rock, Thornton Burgess, water striders, Watercolor, wildlife, Wildlife Sanctuary, Young heron on October 8, 2015 by Barry V..